This exact article is recycled every year when a new iOS is about to be released. I have edited it where needed and republished it so you can be ready for next week’s upgrade to iOS 11. Cutting it close this year but here goes! – I love it! It’s amazing! – Where did all my *name data* go?! – My *name app* doesn’t work anymore! – My phone is messed up now! – I hate it, I wish I could go back. As always there will be people from all of the above camps out there. You won’t know what camp you’ll be in until you install iOS 11 so it’s important to prepare properly so you won’t lose data and/or can downgrade back to iOS 10. If you upgrade, love it and don’t experience a single issue, great. Then you’ll have done all of the following for nothing but hey, better safe than sorry 🙂 Let’s begin. 1. Is your device compatible? If your device is at the bottom of the list, it’ll run iOS 11 but may not run it very well. If your device currently has iOS 10 and feels sluggish, you may want to stop the upgrade process there. iCloud is very convenient but in the case of an upgrade it has it’s limitations. Once you upgrade, you can not downgrade and restore your data. The iCloud backup will not be compatible with an older iOS version so either stick with the latest version or downgrade and lose all your stuff. 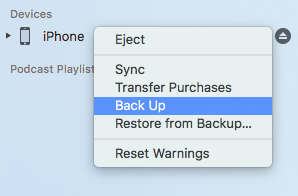 If you backup to iTunes you have more flexibility to restore/recover data if needed and you can downgrade too. Backing up to iTunes is easy and can be done even if you are already backing up to iCloud. Connect your phone to the computer and open iTunes. When your phone appears in the top bar (small iPhone icon) click on it. Then you can click the “Back Up Now” button in the main window. This window appears when you click on your iPhone in the upper iTunes bar. The same bar where you find your music options like “Music”, “Podcasts”, “Radio” etc. You can also right-click your device if it shows in the sidebar* and select “Back Up” from there. Backing up your device via the right-click in the side bar. Backing up your device via the device overview window. * If you do not see the left column (hidden by default in iTunes 12 and up), go to the View menu and select “Show Sidebar”. You can encrypt your backup too, for instructions on that have a look here. The encryption article is dated but the same steps apply. 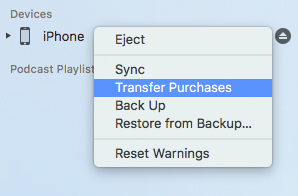 Once the backup is done, right-click on your phone in the sidebar again and select “Transfer Purchases”. This will ensure that all your apps, music, TV shows etc. are saved to your computer. The side bar with your device in it is only visible when you are not looking at your device overview page. It’s confusing and a dumb design flaw. Open iPhoto or Photos and import all the photos from your phone. For many the photos are the most important data on the phone so make sure you have them all stored in iPhoto. In iTunes, go to the iTunes menu and open the Preferences. Click on the ‘Devices’ tab and you should see at least one backup, the one you made earlier. If you have more, just look at the one with the most recent date. Right click on the latest backup and choose “Show in Finder”. This will open a new Finder window and your latest backup is highlighted for you. (Do not open and mess around in these folders as you could corrupt your backup). Now right-click on the highlighted folder and select ‘Compress “name of folder here”. This may take a few minutes depending on the size of your backup. When backups are made in close succession the previous backup is usually overwritten. To make sure your iOS 10 backup is not lost when iOS 11 backs up, locking a copy of it away in a zip file is a good idea. 6. On your iDevice, close all applications and turn off bluetooth. On your iOS device, open Settings > General > About > Applications. This will show you a list of apps that will not work in iOS 11. Tap on an app to visit the App Store and see if an update for that app is available or coming soon. This is not a maybe, the apps in this list will definitely not work in iOS 11 so if there are must have apps in there, do not update your device until an iOS compatible version of that app is available. 8. Upgrade to iOS 11! Chances are you’ll love it and everything works fine. If for whatever reason you need to go back to iOS 9, unzip the file you created earlier and restore from that backup. Keep in mind that there are many developers out there still that have not updated their apps for iOS 10 so a crashing or strangely behaving app does not mean iOS 10 is causing problems. Check the support pages for the apps that are acting up and see if they support iOS 10 or if an update is on it’s way. If you really rely on an app then check this before upgrading. Once iOS 11 is released I will follow up with an article about all the security changes/fixes/improvements. There’s a good chance that article will end up on the Intego blog so be sure to keep an eye on that!